This year I had two Thanksgivings. One with my partner’s family here in New York, and a second with some new-ish but very dear friends. For T2-east, as i’m going to call it (not to be confused with a standing Thanksgiving 2 tradition in California), we actually carried out one of my food bucketlist projects. We made a Turducken. In case any body doesn’t know what that is, a turducken is a Chicken, stuffed inside a Duck, stuffed inside a Turkey. 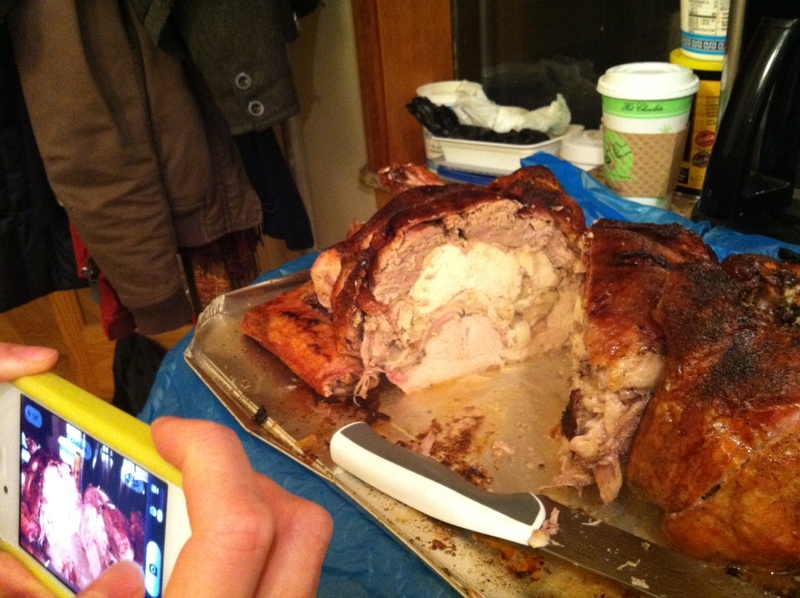 and technically we made a turducken-hen because at the center of the chicken we stuffed a Cornish game hen. Alex goes after the Cornish Game Hen. The entire process was long. It took 2-3 hours to prepare and 4-5 hours to cook. The reason the prep takes such a long time is that each bird has to be de-boned. Starting at the spine on each fowl, you can make an incision and then slowly, painstakingly peal away the meat from the carcass. When you’ve done this for all 3 (or 4) birds you basically have each bird flayed out, as if you unzipped them down the middle, took the “meat-coat” off the skeleton, and laid it down flat. A perfectly de-boned duck, by Megan. 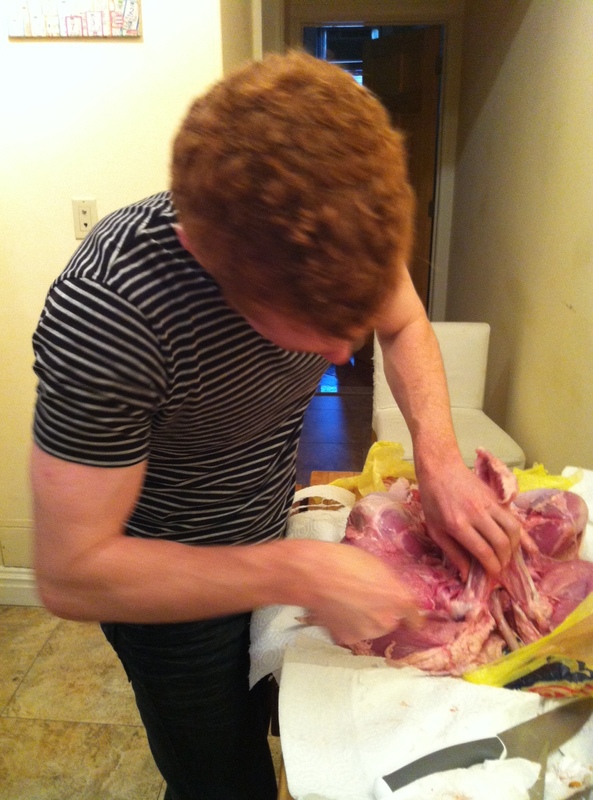 Me, having trouble with the turkey. Then, once you have all 3 sheets of meat, you spice and salt the inside of the turkey “coat” before laying the flat duck on top. 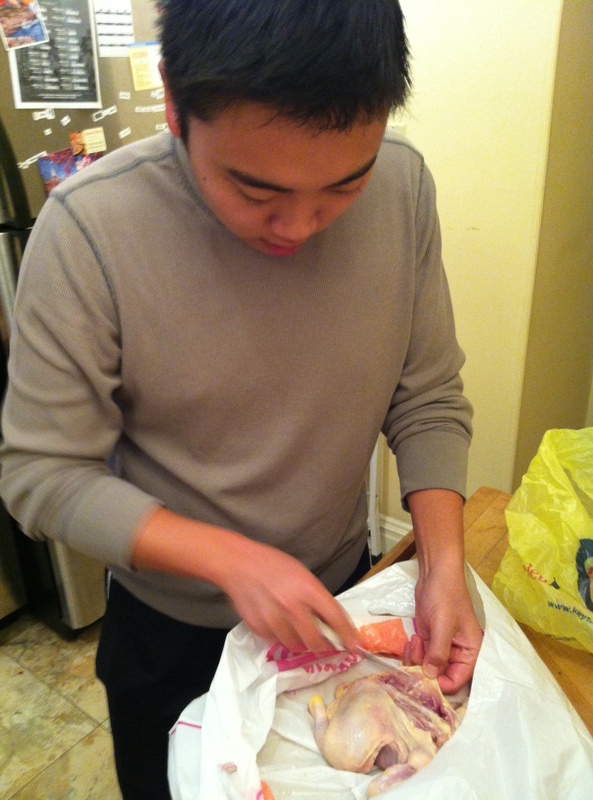 Then you season the inside of the duck, and lay the flat chicken on top. Once you have all your layers you scoop the sides of the turkey back together and twine the meat, what is now essentially a roast, shut. 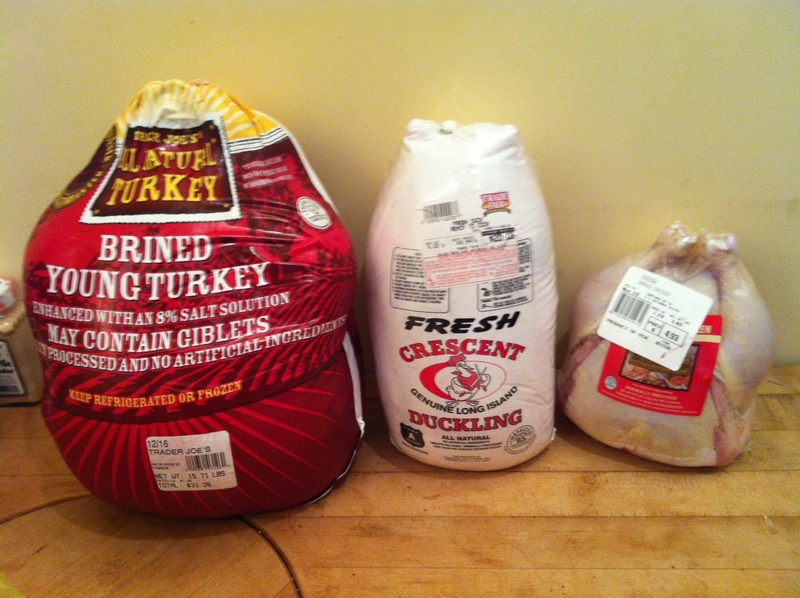 to use the coat metaphor once more, you zip the turkey closed with the other birds inside like russian dolls. I have no pictures of this part of the process because it took all 6 hands in the kitchen to hold the slippery meat in place and tie the strings. From this point, you cook it as you would any turkey. It goes into the oven for about 4 hours. You baste, you wait, you nibble other things. As it was cooking Alex explained to me why the Turducken is great: it’s the duck. Ducks are little fatties- and Turkey and Chicken breast can be dry. When you cook a turducken the duck meat is pressed between the turkey breast and the chicken breast. As the three birds cook the duck fat keeps everybody moist, so all the white meat on the turkey and chicken comes out succulent and moist (basically it makes it more like dark meat, which is generally more awesome). The last thing that makes a turducken fun is that when it finally does come out of the oven you can litterally slice right down the center of it as if it was bread. There no bones left (save the Turkey’s wings and drumsticks which you leave on) so if you slice right down the center you get an awesome cross-section that shows each of the birds and their different colored meats. You will Instagram with pride. This entry was posted in Uncategorized and tagged Cornish Game Hen, duck fat, how to make, New York, thanksgiving, Turducken. Bookmark the permalink.